The State of Washington provides our baseline budget and the salaries of the permanent faculty and staff. With these funds we support the educational and research mission of Western Washington University. Grants and awards come from local and national agencies for equipment, supplies, and student employment for activities related to a specific project. An example of this is the ongoing Lake Whatcom monitoring project, where the University and the City of Bellingham have collaborated for over fifty years. Donations from the public support all activities not related directly to a specific project. One example of this is the Northwest Lakes monitoring project, which provides water quality data and other information for 60-70 lakes in our region. This project was instrumental in Western Washington University being awarded the National President’s Higher Education Community Service Honor Roll with Distinction Award in 2013 and 2015. Most IWS student projects are not supported by externally funded research grants or contracts, and therefore represent a significant burden on the limited resources available for this type of research. Your donation to the Western Washington University Foundation Institute for Watershed Studies Fund will help ensure the success of student projects that benefit the local community. 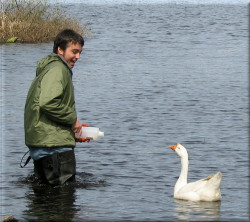 Donations to the Institute for Watershed Studies student research fund are tax deductible.